Clay Shirky makes an interesting analogy between Gin and Television, and their relationship to social and cognitive surplus. Couldn’t help thinking about Hogarth. 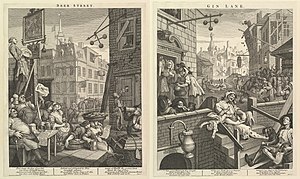 Beer Street and Gin Lane are two prints issued in 1751 by English artist William Hogarth in support of what would become the Gin Act. Designed to be viewed alongside each other, they depict the evils of the consumption of gin as a contrast to the merits of drinking beer. …Gin Lane shows shocking scenes of infanticide, starvation, madness, decay and suicide, while Beer Street depicts industry, health, bonhomie and thriving commerce, but there are contrasts and subtle details that allude to the prosperity of Beer Street as the cause of the misery found in Gin Lane. Nowadays you can get any form of trash on the TV, yet governments from US to China are trying to control the ‘net. Looks like the man has sided with the Gin makers this time. Kinda gives a new dimension to “free as in beer”..